It’s a little more than halfway to Christmas 2014 and Capital Alliance Group has been in their Santa Ana corporate headquarters brainstorming what it is they can do to help their community this year. 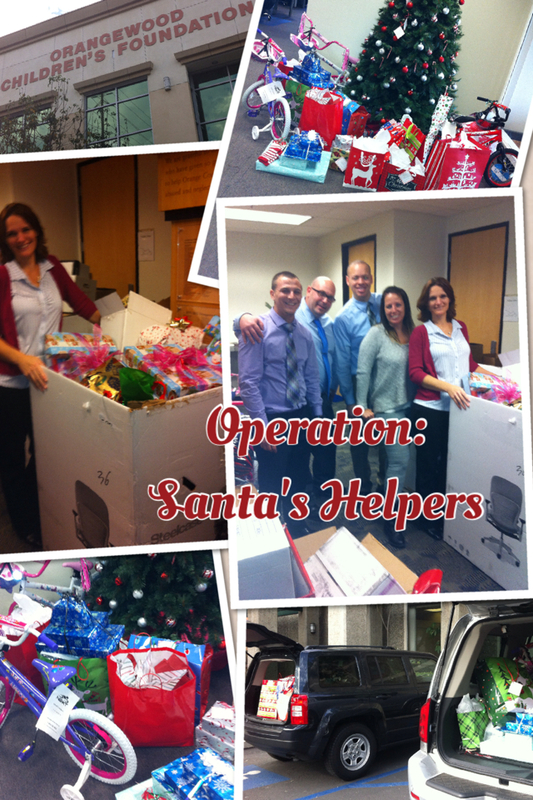 Last year was a great success; Christmas 2013 saw the Capital Alliance team partner with the Orangewood Children’s Foundation to bring to the kids of Santa Ana and Orange County at large “Operation Santa’s Helpers”. This holiday event was meant to obtain and distribute presents to less fortunate kids in the community. Partnering up with Orangewood Children’s Foundation was especially fulfilling. They are life savers– literally. They provide assistance and guidance to abused children, at-risk youth, and families that are in dire straights. Their mission is to end the cycle child abuse one kid or family at a time. Capital Alliance takes a stand in their staunch view that it is part of its responsibilities as a company include making a positive impact on the surrounding community. Operation Santa’s Helpers definitely helped a lot of people and it is a safe bet that they have something equally or even more giving this coming Christmas! Posted on July 31, 2014 by agnesdtodd	Bookmark the permalink.